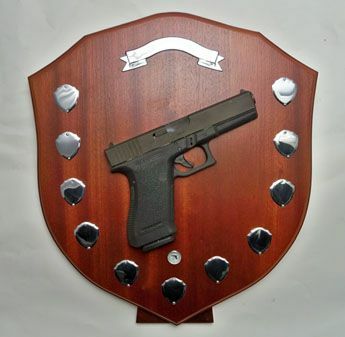 This item is a Glock trophy shield. It has a title plaque and eleven silver name shields all un-engraved. The centre piece is a real Glock pistol which has been destroyed by cutting it completely in half; it has then been mounted securely to the shield. This stunning and unusual piece would make an ideal trophy for shooting events or anything else connected to the shooting world.